After reading the entries to February’s Carnival of Aros prompt and many of the discussions that followed, we would like to start this post by apologizing for choosing a topic that alienated some aros. Most of us here at TAAAP are aroaces, and we did not do enough to seek out the opinions of aros who are not part of or do not feel included in the ace community. We want to do better in the future, and we are starting by reflecting on the Carnival of Aros. The following post contains our thoughts on the events leading up to the launch of the Carnival of Aros, the Carnival itself, and the discussions that have followed. After rebranding as The Ace and Aro Advocacy Project late last year to reflect our focus on aro and ace inclusion and advocacy, we wanted to more fully participate in the ace and aro communities online. We decided to host a month of the Carnival of Aces, as several of our members had contributed to or hosted one previously. Since it was on our mind, we decided we wanted to talk about the relationship between the ace and aro communities. We knew this relationship was strained, and we wanted to get a wide variety of perspectives on why that was, particularly since our goal is to advocate for both identities equally. Several of our members were especially enthusiastic about this prompt for more personal reasons, and were interested in reading about others’ experiences. We reached out to Siggy at the Asexual Agenda (the blog that runs the Carnival of Aces), who was interested in the prompt but wondered if the Carnival of Aces should be rebranded to include aros. We did not like that idea, since we didn’t think the carnival would equally prioritize ace and aro prompts due to the fact that it had been ace-focused for so long. He then suggested asking an aro blogger to start a separate Carnival of Aros that would only intersect with the Carnival of Aces on this first prompt, and would be completely independent. We felt this was a great idea. We thought having the launch topic intersect with the Carnival of Aces would be a good way to publicize the new Carnival of Aros. We meant for the topic to be inclusive of anyone on the ace or aro spectrum, but we did not realize how allosexual aromantic folks might feel about the first prompt topic for Carnival of Aros be connected to asexuality. Since we were involved in the whole process of how the prompt and the carnival came to be, we were not able to see how it would look to those who were not involved and who only saw the end result. There may have been solutions, had we thought of them; for instance, making our idea a later prompt for the Carnival of Aros, so it could be established as an aro-focused event first. This post is coming over a month and a half after the February Carnival ended. We took some time to process the comments we read and to talk to some of the people who were hurt. We understand how despite our intentions, there were people who felt alienated by the way the Carnival of Aros rolled out. We are very sorry for our lack of foresight and the hurt that it caused. We hope that the Carnival of Aros can move past the rough start it had, and that we can all continue working together towards more resources and communities for all aromantic people. In that spirit, we are proactively working to understand ahead of time what the aro community needs by reading non-ace aro perspectives and inviting non-ace aros to join us in the work that we do. However, our organization does not currently have members who represent every way of being ace or aro. While this is something we certainly plan on working to improve, we also know we will never be perfect in this regard because there are as many ways of being ace and aro as there are ace and aro people. We may not be able to anticipate all of the potential pitfalls of our actions, and as a result we may make mistakes in the future. Please do not hesitate to get in touch if you ever think of a way we can improve any of our projects, or—even better— if you would like to become involved yourself. Thank you to everyone who participated in this joint blogging event between the Carnival of Aces and the newly-formed Carnival of Aros! We hope that this event is just the beginning of the conversation on this topic, so we encourage everyone to read through other’s posts and respond with your thoughts. Even if you find this years down the line, if you have thoughts on the topic you should feel free to voice them! Below are all the submissions we have received, along with a short summary of each. Please let us know if we missed anything! My first steps in the asexual and aromantic communities by Isaac at Mundo Heterogéneo. We (TAAAP) wrote a response to this post giving further context to how this topic came about. The Relationship Between the Aro and Ace Communities by Iz N.
Who Should Be Doing Aro Advocacy? This post is TAAAP’s submission to the February 2019 Carnival of Aros/Carnival of Aces, which we are hosting. Read our call for submissions here. The Ace and Aro Advocacy Project was founded about a year and a half ago as The Asexual Awareness Project. Our mission, which started as a simple desire to have aces march at pride and to help aces gain recognition at the Creating Change conference, expanded organically over time. One of the ways it expanded was to include aromanticism fully and equally alongside asexuality. Currently, TAAAP mainly consists of a bunch of aces. Many of us are aro in addition to being ace, but we have also historically prioritized our ace identities over our aro ones. The fact that we started as a specifically asexual organization is perhaps the strongest evidence of that. We are still working to ensure that aromanticism is equally represented as asexuality in all of our outreach and projects, and we know we sometimes fall short. We hope to be able to include more allosexual aromantic people, as well as more aroaces who prioritize their aro identities. The subject of how much aces—particularly those who are not aro, and those who prioritize their ace identity over their aro one—should do to further aro advocacy is a frequently discussed topic right now. There are people who feel that aces haven’t done enough for aros. On the other hand, there are others who have a deep mistrust of anything connected to the ace community, and don’t want aces to advocate for aros. As an organization that frequently works on joint ace and aro advocacy projects, we would like to give our perspective on when these combined efforts are useful and feasible, and when they are not. 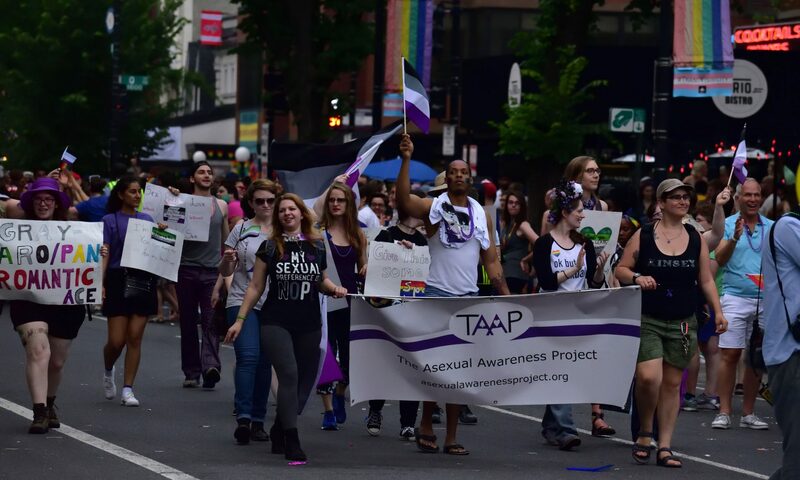 At TAAAP, we focus on helping people and organizations (particularly LGBTQ+ organizations) better include aces and aros in the work that they are already doing. In this context, we find that combining ace and aro advocacy goals can be extremely effective for boosting aro awareness. Many LGBTQ+ organizations are aware that asexuality is a thing, and will seek out training on the topic, but not a lot of them know about aromanticism. By making resources and trainings aimed at this audience equally prioritize information on aromanticism, we are able to spread aro awareness to people who didn’t even know they needed it. Additionally, we believe that a way aces can be good allies to aros in terms of advocacy is by helping them access opportunities that were very difficult for aces to obtain in the first place. For example, aces have been working for years to be included in the Creating Change conference. We have finally been making some strides towards full inclusion of aces, and this year we decided to expand our sessions and spaces to fully include aromanticism—not just as a sidenote to asexuality, but as a separate and equally-important identity. For context, we proposed an aro-specific session as well our four combined sessions. All four combined sessions were accepted, but the aro one was not. Without combining ace and aro efforts at this conference, there would have likely been nothing for aros. In other situations, however, we recognize that joint advocacy efforts might not be as useful, and in fact might actually be detrimental. In visibility in media, for example, if aromanticism is always tied to asexuality, then that only contributes to the misconception that aromanticism is simply a subset of asexuality. While it is often helpful when aces assist in doing aro advocacy and in creating aro spaces, we also don’t think that aces should feel obligated to do so. There is a value in ace-only spaces, and many aces who aren’t aro might not feel like the right person to do that kind of work. That is all okay. As Sennkestra mentioned in her post, many aroaces who are already involved in ace advocacy might not have the time to also dedicate to aro-only advocacy, instead deciding to work on joint ace and aro projects. This is the case for many of us at TAAAP. If this is all there is, however, the ace and aro communities will never have equal resources. We need people who prioritize their aro identity who are willing to put in the work to do aro advocacy and build aro communities—independently of ace efforts. Aces can support the aro advocacy movement by sharing experience and resources, but ultimately it is up to the aro community to make it happen. There seems to be the right momentum building for this to happen now, and we are excited to watch it unfold and to see aro-focused organizations and communities flourish alongside ace ones. The following is a submission by Iz N. for the February 2019 Carinival of Aros/Carnival of Aces. I’m asexual and aromantic, and have identified as such for about eight years now. I have mixed feelings about how I fit in with both identities. I’m much quicker to id as ace, if I say anything beyond just “queer”. I think that’s because it’s easier to know I don’t feel sexual attraction than romantic attraction. Sexual attraction, after all, feels like a physical reaction, which, while murky, is at least relatively simple to pin down. This is particularly true since I have a libido, so I know what sexual arousal feels like – it’s just not aimed at anyone. On the other hand, I don’t get romantic attraction at all. I feel lots of intense and complicated emotional feelings for lots of people in my life, some of whom I love. I’m a naturally tactile person with friends, so I like to hug and hold hands and kiss cheeks and walk down the street with my arm around someone’s waist. I like to go out to dinner and movies with my friends. I have intense and meaningful conversations about our inner emotional lives, as well as discussions of the best young adult writers and who I would fancast as Squirrel Girl. I miss some of my friends deeply when I haven’t seen them in a while, and I like to check in on how they’re doing. All of those activities could be romantic, and on paper could even be read as dating, but they’re not romantic for me. My aro-ness is complicated further because I think I would like a queer-platonic relationship; I’d like to live with someone who is my primary person, and I’d like the relationship to be stable. I don’t care if this person is ace or aro, neither or both, as long as they’re committed to me as well. I know that aro people can want and have that kind of relationship, but it does make me more confused about romance generally – that kind of relationship could and often is seen as a romantic one. I’m starting to feel like I want to be more involved in specifically aro communities. Being involved in ace communities helped me solidify my identity by letting me compare my experiences to those of other ace folks. I’d like to find an in-person aro community (I am very much a Luddite, and do not enjoy interacting on social media), but I feel like aces dominate most of those. My local ace community is actually mostly aroace, but ace topics dominate discussions, and aro conversations are usually an afterthought. I hope that one day I’ll be able to go to meetups that are for aros, where I can discuss these feelings and try to figure out who I am. This post is a submission by Blaise to the February 2019 Carnival of Aros/Carnival of Aces. Sometimes I feel like the mythical Chinese dragon, in which I am Chinese, nonbinary, aromantic and asexual. Having all of these identities, it’s already hard for me to connect with others in the communities I can participate in. Especially the aro and ace communities. Since the aro and ace communities have moved away from each other, in an attempt to create distinguishable communities, I feel that my presence as an aro ace, in the ace community, has been increasingly ignored. Especially in ace awareness events, where many aces say things like, “We’re ace but we can still feel romantic attraction!” or some variation of that statement. While it’s great to let allosexuals know that not all aces are aro, can they just say it in a way to not erase aro and aro-spec aces at the same time? I believe that by saying these statements frequently, the allosexuals will then have this expectation of aces, in how they all experience romantic attraction. And, well, for those who know a bit about asexuality and the romantic orientations, it’s going to be awkward breaking to them that.. at least for me, that I don’t experience romantic attraction either. That reason is primarily why I’ve felt alienated from the ace community recently, and have felt slightly more at home with the aro community. The aro community has also made me realize that issues like amatonormativity is what personally affects me the most, more than compulsory sexuality. It’s to the point where I thought it could be called the alloromantic ace community, for the seemingly dominating narratives of alloro aces in the ace community. Not saying that I have gripes against alloro aces, but I guess this is what happens when the ace and aro communities try to make themselves distinctive to the rest of the LGBTQ+ community, and to cis straights. The shift in narratives dominant in these communities will inevitably erase the more marginalized members. It’s too bad; I wanted to connect with more aro people of colour, but I frankly find more aces of colour than aros of colour. For now, I suppose I gotta make do with who’s out there..
I’m not sure where I’m going with this. I guess the ace community can help re-invite aro aces into their conversations by using statements, especially for ace awareness, to include aro aces. For example, instead of saying “We don’t experience sexual attraction but we can still love [romantically]!”, maybe saying something like, “Some aces can experience romantic attraction, and some aces don’t. It depends on the individual.” And then, as a Chinese aro ace, there’s the issue with the whiteness that’s prevalent in both communities. As for the aro community, I can say that as an aro ace, I understand that voices like mine are the loudest, which can overpower the voices of aro-specs and especially aro allosexuals. I run an Asian ace and aro space online, and I would be interested in knowing how to open up the space to include aro allosexual voices, especially since there are many alloro aces and aro-spec aces in this closed space I moderate. It can be intimidating to share experiences and thoughts as an aro allosexual when there is probably no one who can relate. Breaking the ice here seems difficult, and I will try in any way I can to give them a chance with the mic.